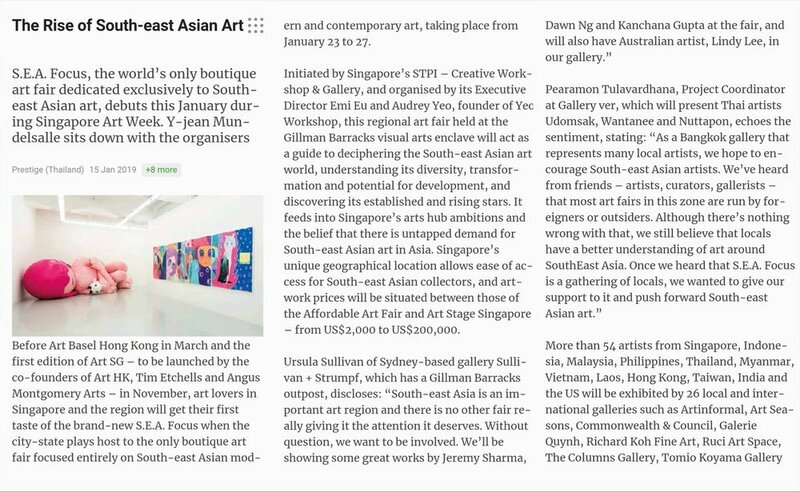 CUC Gallery is honored to be featured in the latest issue of Prestige magazine on a special review about S.E.A. Focus 2019 where CUC participated in last week. Read the full article below in which CUC Gallery Director Pham Phuong Cuc shares her thought about the new-in-town art fair. “Pham Phuong Cuc, Director of Hanoi-based CUC Gallery, shares that the reason the gallery chose to participate was because the focus was on South-east Asian art, and also because "Singapore, as a new art and cultural hub, will be even more critical compared to the past. Vietnam recently has been experiencing many changes and developments in terms of the economy and cultural shifts. We can see the differences and similarities between South-east Asian countries through art. So we hope that through this art fair, for the first time, people can really see and understand where we stand and what we represent."